Women in SF&F Month: Julie Czerneda Post and Giveaway! Today for Women in SF&F month I have science fiction – and newly minted fantasy – author Julie Czerneda! I haven’t read any of her work myself (yet, you might have heard about my leaning pile of books…), but many of the people I trust for reviews have recommended her books quite highly. So highly, in fact, that there is going to be another post later in the month that lists Mac from her Species Imperative series as among the post author’s favorite characters. Based on their recommendation I asked Julie to write of post of her own and she responded with the great one about the women who helped inspire those characters you see below! Also, once you finish reading her post you’ll find a form to enter a giveaway of her new book, A Turn of Light – or you can double your chances of winning a free copy of the book by entering the scavenger contest on her website! Let me preface by saying how proud I am to be part of this series of posts and how awed I am by everyone else’s. I willingly admit I’m expert on only one very small aspect of women in SF/F — me — yet in writing what became an atypically intimate post, I came to understand something rather profound about myself, my past, and my story-telling. Thank you, Kristen, for that opportunity. I started writing for one reason. A book’s ending didn’t satisfy me, so my mother suggested I fix it. I did. (I was ten.) After that, I discovered that I could write entire stories to my own satisfaction, and did. This motherly advice, “fix it,” didn’t just apply to stories, of course. I come from a lineage of women who never looked to others to do what they deemed necessary, be it serve in war or start life in a strange land. If they needed a skill, they learned it. If they saw an opportunity to help, they seized it. They loved fiercely and well, both family and friends, and valued above all civil behaviour. (I’ll get back to that.) Until me, they even had great fashion sense. Fortunately for my appearance in public, our daughter inherited all of the above. That “civil behaviour?” I was taught by example, as was my mother and hers and who knows how many before. (Aside: and our names all begin with “J.” No one knows who started that.) Civil behaviour meant you didn’t eat or drink unless everyone around you could and did. It meant that every penny, regardless who earned it, belonged equally to everyone in the home. It meant honesty (which also included, trust me, underwear as clean and well-mended as whatever was worn over top, for one must be what one appeared to be on every level). It meant music and art and writing, for creativity was paramount. The point of life, I was taught, was to leave the world changed for the better, not just tidy. Oh, and civil behaviour meant listening. I remember my mother listening. To me, yes, but mostly I remember her listening to the people who’d arrive at any hour of the day or night, people who knew our doors weren’t to be locked, people who might be happy or heartbroken or a bit lonely. They’d say they were in the neighbourhood, or were friends of a friend who’d given them our address. Regardless, they came because she’d listen as long as it took. Most came very late, knowing she’d be awake, reading her newspapers at the kitchen table or painting. I’d be there, sometimes, working on schoolwork due the next day. I remember a baroness, wrapped in mink and smelling of smoke. My brother’s friends or their brothers, worried about their welcome at home after a binge. There were relations who came to stay however long they needed and strangers who were old friends with interesting accents who stopped by and stayed too. I’d make tea or find beer, depending. My father would make breakfast, that go-to meal for any time of day. We’d go back to bed, hearing voices in the kitchen, or stay up because if anyone had brought an instrument, a party would start in the basement. I thought everyone’s home ran that way. When I learned they didn’t, I thought “how odd,” but not much more than that. 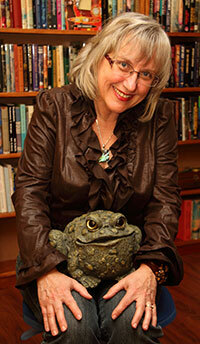 I was already determined to be a biologist and writing my own science fiction. Odd, as in different, was something of a badge of honour and I was proud of my family’s peculiarities. It wasn’t until recently, when I discovered another of my mother’s unfinished creations in a box, that I learned they were nothing new. Civil behaviour. Women who act and create. While I hadn’t stopped to consider the question till this post, how could such women not be the mould for the characters in my fiction? We’re the result of our upbringing and heritage. We value what we’ve learned to value and receive the history told to us as our own. I grew up confident I could do whatever I wanted, if I was willing to work for it, and certain, to my core, that every person was worth listening to unless they were knowingly cruel or wilfully ignorant. Esen, my alien in Beholder’s Eye, is a wonderful listener. Mackenzie Connor, from my Species Imperative books, values friendship (and gets things done). What matters most is the effort we make, whether to improve the world or simply to do what’s necessary. Sira and Aryl. Jenn Nalynn, from my latest, A Turn of Light. Above all, having thought about it, Aunt Sybb from Turn. Egad. The embodiment of civil behaviour, heroically teaching it to a new generation if it’s the last thing she does. It makes me cry, a little, too. At this moment, I realize my Mom would have spotted all this in my work well before I did and would have smiled to see me catch up to the family at last. The women of sf/f. We didn’t get here alone. It’s worth remembering. 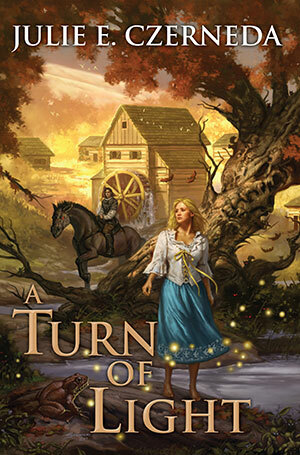 Courtesy of DAW, I also have a copy of Julie Czerneda’s new book A Turn of Light to give away! Giveaway Rules: To be entered in the giveaway, fill out the form below OR send an email to kristen AT fantasybookcafe DOT com with the subject “A Turn of Light Giveaway.” One entry per person and a winner will be randomly selected. Only those with a mailing address in the US or Canada are eligible to win this giveaway. The giveaway will be open until the end of the day on Thursday, April 18. The winner has 24 hours to respond once contacted via email, and if I don’t hear from them by then a new winner will be chosen (who will also have 24 hours to respond until someone gets back to me with a place to send the book).